Snowy Egret by Finky via Birdshare. 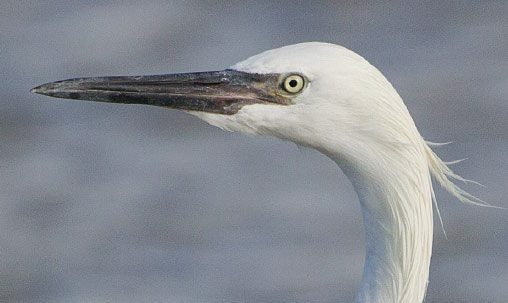 Editor’s note: The following in-depth treatment of the white herons and egrets of North America is excerpted from Better Birding: Tips, Tools & Concepts for the Field, by George Armistead and Brian Sullivan (Princeton University Press). The new book is not a field guide—it’s an exploration of the fine points of identification that anyone can learn with some patient study of similar species. The full volume contains 24 chapters, each focusing on a different group, from sparrows to swans and kingbirds to cormorants. Statuesque, stately, and elegantly plumaged, with long necks and long legs, herons rank among our most conspicuous and beautiful birds. They use their long, sharp bills to stab at fish, frogs, or large insects while gracefully wading through estuarine shallows, ponds, marshes, and ditches. Herons are generally quite social, but some species are more so than others. All these species typically nest in colonies, and larger colonies may number in the hundreds, often containing multiple species. Mixed-species feeding flocks develop in areas with abundant small fish, and such situations allow for great comparative studies. White herons are conspicuous and quite confiding, and beginners find it fun to distinguish between Snowy, Great, and Cattle egrets. They may eventually enjoy the challenge of ageing these birds, and distinguishing them from white-morph Reddish Egrets and immature Little Blue Herons. Florida is a great place to study these species, as well as the enigmatic “Great White” Heron, which occurs fairly commonly in only the southern half of that state. Most white herons are easily identified, yet others puzzle even the most expert among us. Learning the structural differences is key to identification, but habitat and behavior are also important. Habitat preferences, foraging techniques, and feeding postures differ among these birds, and being aware of these helps narrow the possibilities considerably. Learning to age herons is also important, as critical field marks change with age [see the book for details on ageing herons]. Snowy Egret. Note slim, dark bill. Great Egret. Note the mostly yellow, heavier bill compared to Snowy. Cattle Egret. Unlike other white herons, these egrets have short, stout bills. Little Blue Heron (immature). Bill is slightly stout and droopy, and usually bicolored. Reddish Egret (immature). Rather long bill; hint of pink at base. Adults have drastically bicolored bill with pink base and dark tip. Great White Herons have the largest, heaviest bills, unmistakably hefty and yellow; compare with slimmer-billed Great Egret. Photos by Brian Sullivan except Cattle Egret (George Armistead) and Little Blue Heron (Kevin Karlson). Rarely are these herons mistaken for anything but one another. Beware of distant Wood Storks, immature spoonbills, White Ibis, or Whooping Cranes that might cause confusion. Herons usually fly with their necks retracted (coiled, unlike ibis, storks, and cranes) but occasionally extend their necks during shorter flights. Each white heron has a distinctive “GISS” [or general impression of size & shape]. Habitat can be telling, but pay special attention to feeding postures and technique, and the manner of movement. Appreciating these, along with range, helps narrow the choices. In nearly all cases, determining age is an important step. Note the color and pattern of the legs, feet, bill, and lores. Breeding adults have showy plumes and colorful bare parts. Winter adults and juveniles lack plumes and have duller, less distinctive bare parts. Juvenile Little Blue Herons are white, similar to the egrets. Herons in late summer/autumn provide challenges to birders, as adults are in nonbreeding plumage and juveniles abound. Two of these herons are restricted in range and are unfamiliar to many birders. Reddish Egret is coastal, is almost never seen away from the Gulf Coast or north of South Carolina, and is rare in extreme southern California. Many birders are unfamiliar with the white morph of this species. Also, “Great White” Heron (currently considered a form of Great Blue Heron) is restricted to peninsular Florida and is rare north of there. Little Egret is a rare vagrant that may be overlooked by the unwary or misidentified by the overeager. Great care must be taken to distinguish it from Snowy Egret. Get photos! Nonbreeding adults lack long plumes and show more subdued coloration of bare parts, so they can be difficult to distinguish from immatures. 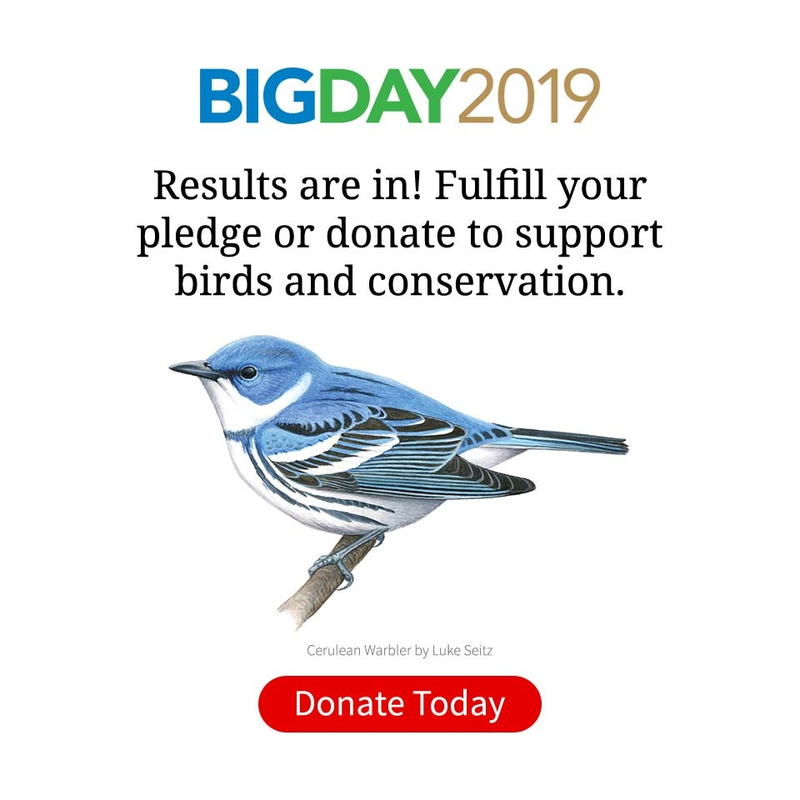 The lores and bill in particular are less rich from August through mid-February, and then they begin to intensify in color (though some species breeding in the south may breed year-round). A second-year plumage in herons requires further study, and most are so similar to nonbreeding adults that they are not field identifiable. Juveniles have dull-colored lores, bills, and legs and are most conspicuous in later summer and early fall. They provide the most regular identification challenges. By spring it seems most first-year birds possess bare parts similar in color and pattern to those of adults. Snowy Egret (nonbreeding). Note long, thin, mostly dark bill, yellow lores, and blackish, bicolored legs (black and yellow). Photo by Brian Sullivan; California, December. Snowy Egret (first-fall immature). Immatures are variable and can have paler bills than are shown here, as well as mostly yellowish legs in summer. By late fall and first winter, they are more adultlike. Photo by George Armistead, New Jersey, October. This slender, medium-sized heron is for many birders the “classic” egret. Habitat choice varies, and Snowy is at home in fresh, brackish, or salt water but seems to favor estuarine shallows most of all. Great Egrets and other herons at times flock around them. Their hunting strategy varies more than that of the others. Often Snowy performs animated pursuits after prey, but at times it also holds still in crouching vigils with its neck coiled before stabbing its prey with its straight bill. Rarely, aerial foraging occurs (e.g., diving, hover-and- stab, flycatching, etc.). Widespread and common on all coasts of the United States and along the Mississippi Valley, they are less abundant in scattered inland areas. In the northern part of their range they are migratory, and migrants are regular to parts of the US-Canadian border (only rarely breeding in Canada) but become scarce north of there. Compare it with Little Egret and immature Little Blue Heron. Snowy nearly always shows a black or blackish bill with yellow lores. Its molt and plumage progression require further study. Adults: Adult plumage aspect appears to be attained in the second fall following prebasic molt. Nonbreeding adults have relatively dull lores and bills and show yellow green along the back of the legs. In breeding plumage (March–August), adults exhibit black bills and nearly wholly black legs, which contrast (respectively) with their bright yellow lores and yellow feet (“slippers”). The lores may become reddish pink on some birds at the height of breeding. The nuptial plumes on the head form a short-moderate shaggy crest behind the nape (becoming spiky when erect). Plumes also extend off the chest and curl up (“recurve”) off the back. Immatures: The bare parts of juveniles are less saturated than those of adults and appear to become similar to those of adults by the first spring. Juveniles have a dark-tipped bill with a greenish or grayish base, and they have greenish legs that become blackish at the front and darken as they age. In spring first-year birds develop some rudimentary plumes. Great Egret (nonbreeding). Great Egret shows black legs year-round, as well as a long, moderately heavy, yellow bill; and importantly, all lack head plumes. Breeding adults show bright green lores briefly in spring. Photo by Brian Sullivan; California, October. Great Egret (nonbreeding). Note characteristic black legs, long, moderately heavy, yellow bill, and lack of head plumes. Photo by Brian Sullivan; California, February. Second in size, smaller only than Great White Heron, the Great Egret is consistent in appearance across all ages. It is easily identified by the combination of its large size, black legs, and stout orange-yellow bill, but some show a black-tipped bill. Slender, long necked, tall, and graceful in bearing, it is deliberate in its movements, frequently foraging with its bill held horizontal or tilted skyward. Great Egrets inhabit saltwater or freshwater, attend mixed heron flocks, and often associate with Snowy Egrets. But they will also form moderately large homogeneous flocks, and sometimes they frequent drier pastoral habitats. A widespread species, Great Egret is common along most coastlines and even inland in many places, as well as north into southern Canada. Adults: Great Egret lacks head plumes. During breeding, the lores become rich green, and the long back (scapular) plumes become evident; the latter at times are stained buffy or brownish. Nonbreeders are similar but lack back plumes, the lores are duskier yellow, and the legs are duskier and less richly black. Immatures: These are similar to nonbreeding adults, but with even duskier bare parts. Compare this species with Great White Heron. Old World breeding Great Egrets have black bills and are accidental in North America, and it is unclear which subspecies has occurred here (A. a. melanorhynchos of sub-Saharan Africa or A. a. alba of Eurasia, North Africa, and the Middle East). Cattle Egret (breeding). Note stocky build, short, stout bill; forages in grassy habitat. Juveniles have black bills and legs for the first few months; bill color changes to yellow in first fall. Photo by Brian Sullivan; California, April. Cattle Egret (nonbreeding). Adult Cattle Egrets change drastically from the colorful breeding plumage to all white in winter. Photo by Brian Sullivan; California, February. This smallest white heron has a compact shape because of its short neck and relatively short legs, both of which suit its terrestrial feeding habits. The bill is short too, only just longer than the length of the head. A bird of farm fields, pastures, and grassy roadsides, it takes grasshoppers, crickets, and frogs and sometimes follows grazing cattle or tractors to feed on the displaced prey. It is the only species in its genus in the world, and the only North American heron in which the color of the plumage changes seasonally. 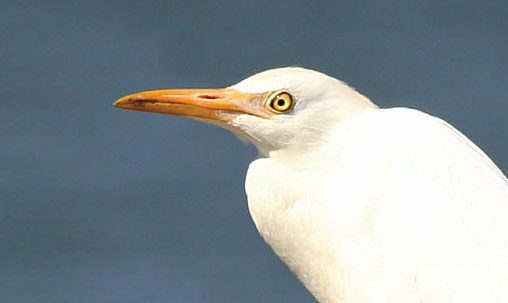 Prior to 1950, Cattle Egrets were unknown in North America, but today they are quite widespread across the Lower 48 and into southern Canada. Their colonization of North America was perhaps initially fed by east winds carrying these birds from North Africa across the Atlantic to the southern Caribbean (Barbados is often the first point of land encountered by such birds, and from there they could have spread north). Adults: Breeding adults are distinctive, white overall but with rich buff orange on the head, neck, and scapulars, and orange bare parts. How these orange areas become orange is mysterious (perhaps it is topically administered), but the coloration is not a result of molt. Rarely, richly colored aberrant birds occur with extensive orange, blue-gray, or even blackish areas instead of the normal peach buff. Nonbreeding adults are wholly white, lack the orange patches, have yellower (less orange) bills, and have blackish legs. Immatures: Juveniles are like nonbreeding adults, with blackish legs but darker bills. (Compare the blackish-billed juveniles with the much larger, longer Great Egret). The bill seems to become yellowish by winter. Little Blue Heron (juvenile). Note mostly white plumage. Compare mainly with juvenile Snowy Egret. Photo by Steve Howell; Mexico, September. Little Blue Heron (juvenile). In addition to mostly white plumage, note dusky wingtips, yellowish legs, greenish lores, and bicolored bill. Photo by Mark Szantyr; Connecticut, October. Little Blue Heron is unique among these species in that the immature differs in color from the adult, appearing almost wholly white in plumage for its first year of life. The white plumage appears to be an advantage in several ways. Foraging Snowy Egrets attract other herons, including Little Blues, and Little Blue Herons’ feeding success increases when they hunt in association with Snowies. But the Snowies and other herons often drive off the dark Little Blue adults while ignoring the white youngsters. The white immatures are thus given time to master fishing techniques amid more abundant prey. They are also afforded a measure of safety as part of a flock. Immatures are less experienced and more vulnerable, and since white herons are preyed on more than dark ones, as part of a flock they benefit from the increased predator detection and safety in numbers. Only first-year birds are white or mostly white. Adults are a distinctive inky gray blue or purplish blue. The white first-year birds remain white through the first winter but then become dappled with slate blue–gray feathers as they transition to adult plumage in their first summer. These dappled birds are called “calicos” and are quite distinctive, though usually visible for only a few months in summer as birds complete their second prebasic molt. Birds mostly of the Gulf Coast, the Mississippi Valley, and the Southeast, Little Blues occur widely if uncommonly inland and are scarce or rare in the Southwest and in California. In their normal range, they are generally less numerous, and more solitary than other herons and egrets, but they will take advantage of abundant food and join mixed heron flocks. It is the white juveniles that are most confusing for birders. Similar in size to Snowy Egrets, juvenile Little Blues are slightly heavier, with thicker necks and a heavier, droopier, usually two-toned bill that is paler at the base. The lores are grayish or yellowish (never bright yellow) and blend into the gray-based bill, which becomes darker toward the tip. Note their structure and generally sluggish movements. When they forage, the bill is usually pointed down (not horizontally). The white juveniles usually show dusky tips to the primaries, and these are especially noticeable in flight. Leg color varies somewhat but is nearly always greenish, often becoming darker toward the first spring. Reddish Egret (immature). Determining the age of Reddish Egrets can be difficult. Bill color changes from all dark on fresh juveniles to bicolored on adults. By fall juveniles usually have some hints of pale in the base of the bill. Photo by Brian Sullivan; Bahamas, November. Reddish Egret (presumed second-year). Nonbreeding adults have pale-based bills (pale pink), but the demarcation between base and the dark tip can be blurred compared with the high breeding bill pattern. Note moderate size, long neck, and bill structure. Photo by Greg Page; Texas, August. The white morph of this uncommon species occurs only in the Gulf of Mexico and along the Southeast coast north to South Carolina. The species also occurs sparingly in southern California (and south along the Pacific Coast of Mexico), but all individuals there are dark morphs. The total U.S. population is believed to be only about 2,000 pairs, and white morphs make up just 2–7 percent of the Gulf Coast population. In part because dark morphs predominate, the white morphs are subject to neglect by unwary birders, especially vagrants away from the Gulf region. Vagrants are known north along the Atlantic Coast to New England. Inland records are exceptional. Nearly all (perhaps all?) vagrant records, however, pertain to dark morphs. Want to learn even more about the fine arts of observation and identification? Get a copy of Better Birding: Tips, Tools & Concepts for the Field, by George Armistead and Brian Sullivan (Princeton University Press). The full volume contains 24 chapters, each focusing on a different group, from sparrows to swans and kingbirds to cormorants—enough for a lifetime of practice and learning. Reddish Egrets are intermediate in size between Great and Snowy egrets. They are slender, long legged, and long necked and have a fairly thick, straight bill and long, dark gray legs. Usually they are solitary, and they feed almost exclusively in open saltwater shallows, preferring salt lagoons, and less commonly coastal ponds. They hunt in an animated, acrobatic fashion, engaging in dashes, leaps, jogs, and sprints, raising their wings for balance or to startle or detect prey. An actively foraging Reddish Egret, with all of its antics, can scarcely go unnoticed. They also commonly employ the technique of “canopyfeeding,” in which they raise their wings in a circle to shade the water and attract their prey. They will also raise and flick their wings to startle prey. Compare the white-morph Reddish Egret to the smaller yellow-footed Snowy, or the sluggish immature Little Blue Heron. Sometimes individuals with a mix of white and dark feathers occur. They somewhat resemble “calico” Little Blues, appearing as dark-morph adults with some white feathers mixed in. Behavior, habitat, bare part coloration, and structure are the keys to identification. Reddish Egret attains full adult plumage in its third fall, and immatures can cause confusion when unfamiliar. Adults: On breeding adults the back and scapulars are adorned with stringy plumes, and the bill is distinctively pink based and bicolored. The bill and the shaggy mane of plumes on the head and neck are the adult’s most distinctive features, but these are less noticeable in late summer to winter, when the bill color is muted, though still bicolored. Immatures: Juveniles lack plumes and may show yellowish in the lores and a mostly dark bill. They may appear similar to Snowy Egrets, but note that Reddish Egrets are larger and sturdier and have bigger, stronger, grayish legs. Second-year birds have dark gray bills, and note how the dark lores off set the pale eye. Most second-years show some shagginess about the head and neck. Great White Heron (breeding adult). Note head plumes on breeding bird, which help distinguish it from Great Egret. Photo by Martin Meyers; Florida, December. Great White Heron (immature ). Note general large size (like Great Blue Heron), long neck, heavy yellow bill, and pale legs. Photo by Tom Johnson; Florida, March. The largest heron in North America, Great White is very rare outside central and southern Florida (and quite rare elsewhere in its range; confined to the Caribbean). Though they are regular throughout most of the southern half of the state, Florida Bay holds the majority of known Great White Herons, with about 850 breeding pairs. Very few are known to breed anywhere else in the world. Given their apparently small population, Great Whites exhibit a rather strong tendency to stray, with vagrant records west to Texas, north to maritime Canada, and inland to the Great Lakes. Along with their large size, a most prominent feature is the very heavy and mostly yellow bill. Compared to the superficially similar Great Egret, the Great White is heavier overall and not as bright white, and the legs are dusky pale to grayish yellow. The Great White prefers saltwater, inhabiting mangroves, tidal shallows, or coastal ponds. It is mostly solitary, usually moving slowly and deliberately. Adults: Breeding adults have medium-long slender head plumes that extend off the nape. The back plumes are short compared to those of Great Egret. The lores are grayish, becoming bluish during the breeding season. Immatures: These lack plumes and have less richly colored bare parts, and usually darker bills, with a darker maxilla and mostly yellow mandible. The “Wurdemann’s” Heron of the Florida Keys is the product of mixed pairings between Great Blue and Great White herons. It is intermediate in size and plumage, showing a Great Blue–like body but usually with a variably whitish head and neck. Little Egret (breeding adult). Little Egret averages slightly larger, longer necked, and generally bulkier. Adults have two elongated head plumes, very different from the shaggy plumes of Snowy. Photo by George Armistead; Ethiopia, May. Little Egret (nonbreeding). Note the all-black legs and grayish (not yellow) lores. 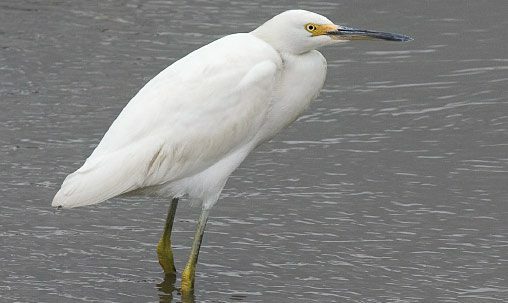 Beware of hybrids with Snowy, which appear similar to Snowy Egret and have yellow lores, but usually show head plumes like those of Little Egret. Photo by George Armistead; Oman, December. Little Egret is an Old World species and an accidental vagrant to eastern North America, with records scattered between Newfoundland and Virginia. The nominate form (E. g. garzetta) breeds in Eurasia and parts of Africa and has recently nested in small numbers as close as Barbados. It is very similar in habits to Snowy Egret, but generally, Little is slightly less animated when feeding. Though structurally they are very similar, Little Egret is more slender, with a slightly longer, more daggerlike bill. It is also slightly taller and longer necked, often appearing flatter headed. All differences are subtle, though, and require comparative experience to discern, and even then they may be difficult to note. Give It a Try: How many heron species can you find in these images? Four heron species in flight: Great Egret (left); Snowy Egret (lower middle); Little Blue Heron (lower right); Cattle Egret (upper right, and trio of smaller birds). The same structural and bill/leg color differences generally apply to these species whether they are in flight or perched. Note Great Egret’s larger size and longer legs, and note Cattle Egret’s compact overall structure. Composite; photos by George Armistead and Brian Sullivan. Snowy Egret (left) with Great Egret. In this direct comparison, note the much larger size and more elongated structure of Great, with bold yellow bill. Photo by Steve Howell; California, October. Reddish Egret (breeding adult; right) with Snowy Egrets. Note larger size of Reddish, and striking bicolored bill. Reddish is primarily a saltwater bird, whereas the other herons are also found inland. Photo by Kevin Karlson; Texas, April. Little Blue Heron (immature; right) with Snowy Egret. Roughly the same size, but note Little Blue’s stouter, bicolored bill and greenish legs. Photo by Tom Johnson; New Jersey, September. In this fairly typical scene, various species of white herons feed together in a Florida ditch. 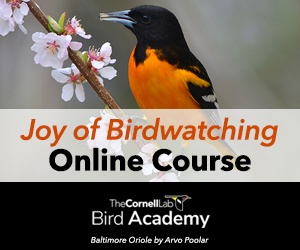 Key elements of structure and behavior will quickly help you sort out these birds. From front to back: Great Blue Heron (white morph), Snowy Egret, Great Egret, two Snowy Egrets. Photo by Brian Sullivan.